As Dan wrote in his review of the full-size model, the CQC-7 is one of the very first and most influential tactical knives in the world. Ernie Emerson’s influence on the perception and use of folding knives for self-defense is incalculable. I had wanted an Emerson knife for a long time, but my general reluctance to carry a blade over 3” meant that most of their standard models, the CQC-7 included, were a no-go. I had my eye on the Mini CQC-7 for a long time before it came back into production and I was able to pick one up. History aside, my thoughts on this design are mixed. I think that the CQC-7’s pedigree has made EKI loathe to futz with the design of the knife, and users loathe to criticize it. This is a shame, because I think there’s a lot of room for improvement. Like the Delica, the Mini CQC-7 is an outdated knife. When it first released, it must have seemed like a revelation, but in 2016, it is neither the best design around, nor worth the price it is being sold at. The Mini CQC-7 has a blade length of 2.9”, a handle length of 4 1/8”, and an overall length of 7.25”. It weighs 4.4 oz. This is a fat knife, but one that feels quite balanced in the hand. The exact weight of a knife isn’t as important as the distribution of that weight: that’s why some light knives, like the Clipitool, can feel heavier than they are, and chunky knives like the Mini CQC-7 lighter. The 2.9” blade, on my Mini CQC-7, is a chisel ground tanto. This is a real one-two punch in terms of things I have grown to dislike. There’s an unwarranted reverence for the tanto blade shape. I appreciate a run of straight edge on my blades but I want some belly too, and the stylized, angular shape of the American tanto lacks any at all. Of course, it’s the tanto’s reputation as an ideal tactical blade shape that gives it its cachet. And it is a good piercer, with a quite a robust tip. But a good drop point or clip point blade would have excellent piercing capability and more than adequate tip strength, as well as a significantly more useful overall shape. I don’t carry a knife with the intention of using it for self-defense, but even if I did, I would prefer another blade shape: the tanto doesn’t do anything significantly better than a drop point or a clip point, and many things worse. The Mini CQC-7 is chisel ground. The argument for the chisel grind is as follows: better strength, better edge retention, and it’s easier to sharpen. There have been long and articulate counterpoints made against these arguments, but for me it comes down to the simple fact that a chisel grind just cuts worse. So much control is lost. Cuts track terribly through material. Approaching thin material like paper is a chore. I understand that some knives are made for hard use, and in these cases durability is more desirable than finesse, but here’s the thing: you can have both. The well-executed, traditional v-grind of the Paramilitary 2 can take a beating and slices like a dream. Maybe, maybe, in the vacuum of theory, a chisel grind can withstand more abuse than a traditional V-grind, but I would bet it isn’t much more, and in what real-life scenario is it going to matter? And as far as sharpening goes: well, I guess it takes less time to sharpen one edge bevel than two, although you still need to maintain the unsharpened side of a chisel-ground knife, so you’re only saved a modicum of effort. The steel on the Mini CQC-7 is 154CM. This is one of my favorite steels, and one I think can compete with N690Co for the title of Most Underrated Steel in the World. It is a solid upper-mid-tier steel that responds to sharpening as well as something like 8Cr13MoV, but holds an edge longer. No complaints about 154CM itself. But the Mini CQC-7 costs about $165. As much as I’m sad to see the middle of the market drop out, one good thing that’s come from it is that we can expect a lot from knives in $150 – $200 price point. The Benchmade Valet costs $170 and has M390. The Zero Tolerance 0770 comes in Elmax for $120. You can get the Spyderco Mantra comes in M4 for $167. The Native 5 LW is half the price of the Mini CQC-7 and comes with S35VN. This segment of the market is so competitive that I feel alright harping on the price a bit. Amidst such company, at such a price, 154CM is unacceptable – even more so when you consider that CPM-154, the powder metallurgy variant of 154CM, has been around for a while now. I think that, like the chisel grind and the tanto blade, EKI’s steel choice has been given a pass because of the historical significance of the brand and its blades, and the Mini CQC-7 suffers as a knife for it. The Mini CQC-7’s handle is wonderful. The thickness of the knife and the swell in the middle of the handle work to make the Mini CQC-7 very comfortable in hand. The jimping is mild, really better for indexing than for locking your hand in place. The real grippiness comes from the G-10, which is very coarse without being overly aggressive like Cold Steel G-10. Superbly executed all around. The clip is the same clip you see on almost every Emerson, and like the ergonomics it is an unqualified win. And, as thick as the knife is, I don’t mind it in the pocket. It stays out of the way and isn’t so bulky as to be noticeable when I’m walking around – again, showing how important distribution of weight is with pocket knives. The Mini CQC-7 isn’t tapped for left hand carry. Emerson can tap it for you, but A) you have to get the knife from EKI or send it in, and B) it will cost you $25. There are a lot of knives with non-repositionable clips, even at this price point, but given how integral the wave opening is to the design of the Mini CQC-7 it should come drilled for righties and lefties out of the box. For reference, the Emerson/Kershaw collabs are all drilled for both. The Mini CQC-7 can be deployed via two different methods: either by the thumb disk or by the Emerson wave opener. The thumb disk works but is slow – pretty smooth, admittedly, but slow. It almost feels like the knife is pivoting between two layers of cloth. From what I understand the Nylatron washers here are another Emerson standby. I don’t mind them, and if they are supposedly lower-maintenance than phosphor bronze or Teflon washers then that’s fine. Just know that you’re never going to flick this knife open. Of course, the way you’re supposed to deploy the Mini CQC-7 is with the wave opening feature. The wave is a small hook on the end of the thumb ramp that, when you pull the knife from your pocket, catches on your pants seam, opening the knife as you are retrieving it. It’s…fine, I guess? I’ve had multiple wave opening knives and I don’t really buy into the utility. I’m not good at it. I get a lot of misfires. It makes traditional retrieval a bit complicated; the wave will catch a lot of the time and half-open the knife; I’ve cut myself more than once because I pulled a half-open Mini CQC-7 out of my pocket. It’s also not a ‘polite’ way of opening a knife around folks who may not be comfortable around edged tools. I wouldn’t fault it for that if it were a larger, more distinctly tactical knife, but even the Emerson literature implies that the Mini CQC-7 is something you can take with you anywhere. If subtlety or politeness is a concern, then you may find the wave opening method a little theatrical for the non-knife people around you. The Mini CQC-7 has a titanium liner lock. It works. Like any lock made of titanium, I worry about wear over time, but the worst thing I can say for it over two years of ownership is that it doesn’t always lock up at the same point against the tang. If I deploy it hard it travels far across, but if I roll it slowly it just barely slides underneath. To be expected? Probably. I don’t recall noticing this happening on any steel liner lock knives I own, but regardless lockup is very good. I’ve been hard on the Mini CQC-7. I want to stress that, in a vacuum, it’s a fine blade. But it doesn’t exist in a vacuum, and not even years of accreted Emerson mythology and reputation can save it from looking hopelessly out of step and overpriced in today’s market. A Mini CQC-7 with CPM-154, a slimmer handle, a conventionally-ground drop point blade, and tapped for both left- and right-handed carry would be an interesting proposition at the price it’s being offered at. But that isn’t the knife we have. We have the same blade, more or less, that Emerson was selling a decade ago, and probably the same blade they’ll be selling five years from now. I know that Ernie Emerson and his team are probably working on new designs instead of trying to update old ones, but if there were one in the lineup that deserves an update, it’s the CQC-7. This pioneering tactical knife has been left in the dust. I’d like to see it be at the vanguard again. 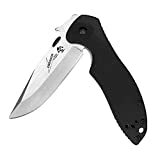 Editor: I recommend purchasing the Emerson Mini CQC-7 at Amazon or BladeHQ. Please consider that purchasing anything through any of the links on this website helps support BladeReviews.com, and keeps the site going. As always, any and all support is greatly appreciated. Thank you very much. Editor’s Note: This is a fairly critical review from Ben, but I think it is well reasoned and ultimately fair. The value proposition for knives like this Mini CQC-7 continues to shrink in light of all the advancements in the marketplace. Also, the price point of these Emersons are just painful. If this was a $100-120 knife, I think a lot of the CQC-7’s perceived shortcomings could be overlooked. Still, the CQC-7 remains a classic, and if you are curious about Emerson knives or can find a nice deal then I think this is a good place to start.